I’m in no position to stop Middle East violence. Or Russian. Or Asian. Or African. Or American, for that matter. What I’m best positioned for is to interrupt the violence within myself. In my heart. And in my actions. Now I’m a pretty peaceable guy. But there are times when non-violence eludes me. So I do my best to continue healing from the trauma of past violence and live into a future of peace for all, including myself. Peace is not only the goal, peace is the practice to get there, to that real peace of liberty and justice for all. Practicing peace can happen each time I take a breath (ruach, spiritus). Breath has no agenda except for extending life for one more moment. Breath doesn’t breathe in some romanticized past nor even in some hoped-for future. Breath breathes in the present. When I am conscious of my breath, I’m conscious of every action I contemplate and conscious of every action I take. Practicing peace, I have my emotions; they don’t have me. I have my thoughts of anger or retribution or harm; they don’t have me. Conscious of breath, I’m conscious that I am bigger than my thoughts and emotions and much much bigger than my anger. Rev. Dr. King credited Gandhi with teaching him ahimsa, translated as “non-violence.” Gandhi, in turn, credited Unitarian gadfly Henry David Thoreau with teaching him how ahimsa works in practice. The Unitarian Universalist mission I serve developed from lives of people like Socrates, Siddhartha, Jesus, Thoreau, Gandhi, and King. Up to now, we’ve not declared ourselves a pacifist faith. But we are a peacemaking faith. When there is conflict, we breathe in the present. We try to listen deeply to what lives within us and to what our partners in conflict say or don’t say, do or don’t do. We try to listen most deeply to the promptings of the Spirit of Life that leads us, albeit in fits and starts, to the Peaceable Reign of God… beginning in our hearts, extending to our neighbors, reaching for the time when it lives throughout every nation, city, neighborhood, street, and home. God speed the day. Person by person, day by day, moment by moment, breath by breath, we move the culture imperceptibly. After all, culture is just the accumulation of myriad thoughts and actions of a people. Our only choice is whether we breathe toward a culture of violence or breathe toward a culture of peace, of real peace, of communion, of the common good, of beloved community. Breathe to peace. 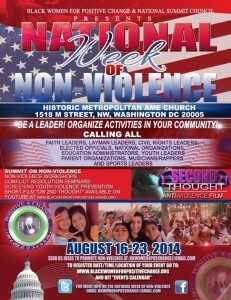 Learn more about the National Week of Non-Violence.